The purse is beautiful! What make is the fun fur? It is a gorgeous colour and has such a shine to it! Hi BJ, I can’t find the label! I searched for it and could not find it. I got the name of the color from my receipt. I bought it from Joann Fabric store. When I go back I will get the name of it. Hi BJ I found the label for the fun fur yarn. It is called Pelt by Lion Brand and the color is called Red Fox. 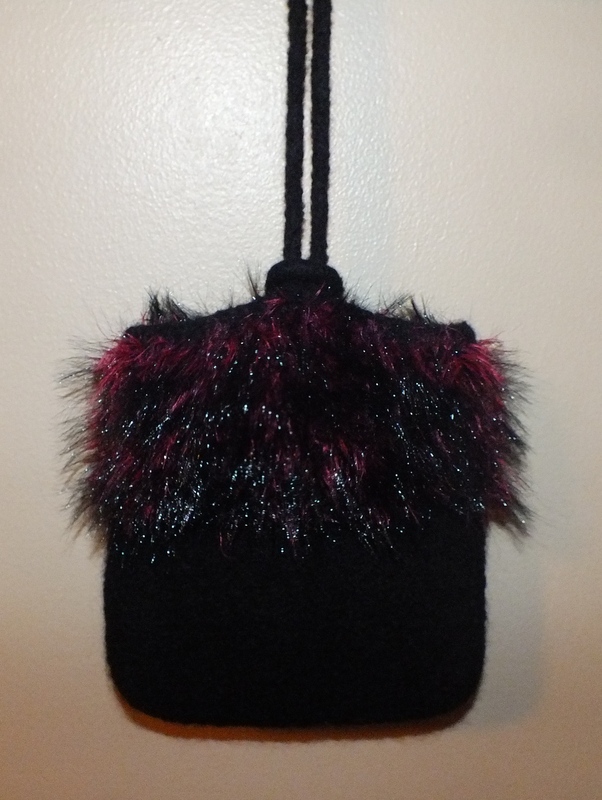 I have just knitted this purse from the pattern you kindly provided. However, I cannot see any reference to it being sewn together, nor do I understand why you cast on an extra 6 stitches each side on the front – is this a gusset? Do you sew it together before you felt it? Any help would be appreciated. Hi Jill, yes you sew it together before felting. Knitting the extra stitches on each side gives the purse a rounded shape after felting but most important it gives you room between the front and the back so you can put items in without the purse bulging. When you sew it together, it will look square with a bottom and sides. Hope this helps.